Timely surgical decompression of tuberculosis (TB) of spine can lead to favourable prognosis and good outcome of pregnancy. It can be a diagnostic and therapeutic challenge to successfully maintain the balance between the physiological demands of the mother and the fetus during anaesthesia and surgery of this patient in the left lateral position under general anaesthesia with one lung ventilation with due maintenance of haemodynamic stability and oxygenation of the mother and fetus. A 23-year-old primigravida with 26 weeks gestation came with complaints of bilateral lower limb weakness since 15 days and low backache since 2 months along with bladder incontinence. She was started on an anti-Koch's therapy category 1 on admission. Clinical examination revealed power on both lower limbs as 3/5 with increased tone and exaggerated reflexes. There was loss of sensation below T10 level with bilateral extensor plantar response. Per abdominal and ultrasound (USG) examination revealed uterus of 26–28 weeks gestation with single viable fetus. General, systemic and airway examination were unremarkable. All routine investigations were within normal limits. 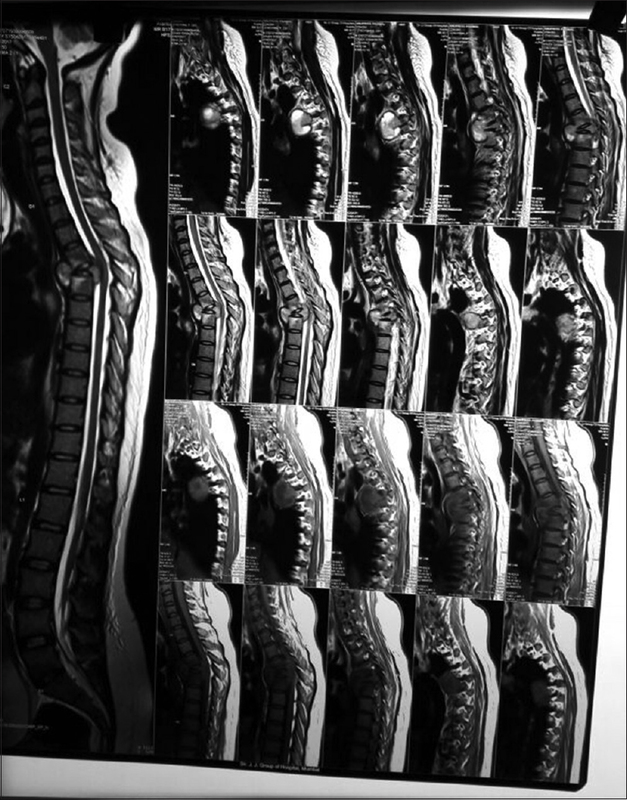 Dorsolumbar spine MRI showed infective spondylodiscitis with prevertebral/paravertebral epidural collection and compressive myelopathy at T3–T5 level [Figure 1]. A decision for surgery was made after consulting the neurologist and obstetrician and after explaining the risks and taking written informed consent of the patient. After preoperative fasting of 8 h before shifting the patient to operation theater, patient was given ranitidine 150 mg and ondansetron 4 mg parenterally as aspiration prophylaxis. In the operating room, standard monitoring was applied in the form of electrocardiogram, non-invasive blood pressure cuff, pulse oximeter, and end-tidal carbon dioxide monitoring and a roll was placed under the patient's right hip to provide left uterine displacement. Foetal heart rate was confirmed by the obstetrician with Doppler monitoring (130–140/min) and isoxsuprine 20 mg intramuscular was given as a prophylactic measure to prevent premature labour. After pre-oxygenation with 100% oxygen for 5 min she was pre-medicated with parentera glycopyrrolate 0.04 mg/kg and modified rapid sequence induction was done with fentany l. 2 μg/kg, propofol 2 mg/kg, and rocuronium 0.8 mg/kg. Anticipating a difficult obstetric airway the No. 3 blade of the C-Mac Videolaryngoscope patient was intubated with left sided size 32 Fr double-lumen tube. Position and lung isolation were confirmed with auscultation and fiberoptic bronchoscopy. Left radial arterial line was inserted and right internal jugular vein was cannulated for central venous access. Anaesthesia was maintained with a mixture of O2 and air (50:50) and sevoflurane (MAC 1) and intermittent rocuronium injection. Careful left lateral position was given and all pressure points were padded. A lead shield was placed on the abdomen to protect the foetus from C arm radiation used intraoperatively followed by confirmation of position of the DLT. After pleural exposure, one lung ventilation was initiated and maintained for 2-and half hours. Ventilatory settings during lung isolation at 0.7 FiO2 were adjusted to deliver a tidal volume of 5–6 mL/kg R. R of 20–22, positive end-expiratory pressure (PEEP) of 5, and airway pressure of up to 30. Serial arterial blood gas (ABGs) were done to maintain pH 7.35–7.45 PO2 >90% PCO230%–40%, and haematocrit 33%–35%. There were no episodes of intraoperative desaturation. Surgery lasted for 4 h. She remained stable throughout the procedure with heart rate and blood pressure never deviating >20% from baseline. For analgesia a total of 3 μg/kg of fentanyl was given for the surgery, paracetamol infusion 20 mg/kg, and intercostals nerve block with 0.25% bupivacaine was given by the surgeons during closure. The foetal heart rate (FHR) was monitored with Doppler ultrasonography during the induction of anaesthesia, emergence, and recovery. No change was detected in the FHR (140–160 bpm). The patient did not develop uterine contractions peri-operatively. Once the operation concluded, the patient was returned to the supine position and extubated without complications. Postoperatively, FHR was approximately 120 bpm. Post-surgery histopathological evaluation of the surgical specimen confirmed TB infection and the patient continued antitubercular drug therapy for 9 months. She was advised regular follow up for sensory and motor system evaluation which showed improvement at each visit. She delivered a healthy girl child at 36 weeks of gestation by caesarean section. Lower back pain in pregnant women is not always benign, in fact if the diagnosis is delayed it can lead to serious complications. Despite the increased vascular volume extrapulmonary TB is rare in pregnant women., Spinal TB accounts for 2% of all cases of TB. One-third of cases of skeletal TB involve the spine. It can be associated with psoas abscess, cord compression, paraplegia, or quadriplegia. The sub-clinical course of spinal TB in early pregnancy can progress to aggravation or worsening of the disease leading to spinal injury in late pregnancy. According to the recommendations issued in 2003 by the United States Centers for Disease Control and Prevention, the Infectious Disease Society of America and American Thoracic Society, a 4-drug regime should be used empirically to treat Pott's disease. Isoniazide and rifampicin should be administered during the whole course of therapy and additional two drugs are used during first 2 months of therapy., The first line agents suggested by the CDC during pregnancy seem to have minimal risk of induced congenital anomalies. The anti-tubercular drugs should be associated with steroid (20–60 mg/day for 6–8 weeks). Pregnant women with paraplegia are at increased risk of urinary tract infection, decubitus ulcers, preterm labour, and autonomic hyperreflexia -all potentially life-threatening complications. Several important factors should be considered when contemplating a surgical intervention for the parturient in her second and third trimester, including positioning, anaesthetic type, FHR monitoring, plans for urgent delivery, monitoring of maternal blood pressure, aspiration prophylaxis, and tocolysis for the prevention of preterm labour. The American College of Obstetricians and Gynaecologists recommend continuous FHR monitoring in non-obstetric surgery from 18 to 20 weeks of gestation, based on the patient and the surgery to be performed. Many physiologic parameters change during pregnancy. Significant changes in minute ventilation functional residual capacity, and anaesthetic requirements occur during the second and third trimesters and may predispose the mother to increased sensitivity to anaesthetics. The decrease in FRC is a major cause for concern during single lung ventilation as episodes of desaturation would be detrimental for the foetus as well. However we did not experience any difficulty during this case. Risk factors for haemodynamic instability in these patients are pregnancy-induced aortocaval compression, massive fluid shift, blood loss, and prolonged surgery. Also autonomic dysfunction has been reported as the cause for high incidence of intraoperative hypotension in adult patients with thoracic spine TB. In their case series, Han et al. performed surgeries in ventral decubitus in the first trimester and at the beginning of the second trimester, and the surgical timing was also taken into account. This article recommends that in the second trimester, discectomy should be preferably performed in left lateral decubitus to avoid aortocaval compression by the gravid uterus which could lead to catastrophic hypotension and haemodynamic instability, finally, in the third trimester, only left lateral decubitus is recommended. Our patient was also given a similar position as recommended. Rapid-sequence intubation of a double-lumen tube is difficult, especially in patients with difficult airway. Kurahashi et al. reported successful rapid-sequence intubation of a patient with difficult airway using a double-lumen endotracheal tube (DLT) with the Pentax-AWS Airway Scope equipped with a newly developed Intlock for DLT. In our patient in anticipation of a difficult DLT insertion in an obstetric airway we used the C-Mac Video laryngoscope and position was confirmed with fiberoptic bronchoscopy. In our case taking into consideration the period of lung isolation, utmost care during anaesthetic management centred on preventing hypoxemia, hypotension, acidosis, and hyperventilation which could lead to exaggerated effects on the mother culminating in foetal acidosis and bradycardia. An arterial line enabled us to monitor the oxygenation, ventilation, and acid–base balance. Our case demonstrates that surgery for Potts spine can be safely performed through transthoracic approach with single lung ventilation technique with thorough monitoring of oxygenation, ventilation, acid–base balance, and haemodynamics of the mother and foetus. Singh H, Singh J, Abdullah BT, Matthews A. Tuberculous paraplegia in pregnancy treated by surgery. Singapore Med J 2002;43:251-3. Kaul R, Chhabra HS, Kanagaraju V, Mahajan R, Tandon V, Nanda A, et al. Antepartum surgical management of Pott's paraplegia along with maintenance of pregnancy during second trimester. Eur Spine J 2016;25:1064-9. Yusuf N, Ali MA, Ahmad Q, Rahman L, Nigar T. Pregnancy in Pott's disease: A case report and review. Bangladesh J Obstet Gynecol 2010;25:37-40. Lowenstein L, Solt I, Fischer D, Drugan A. Spinal tuberculosis with paraplegia in pregnancy. Isr Med Assoc J 2004;6:436-7. 5	Luewan S, Bunmaprasert T, Chiengthong K, Tongsong T. Spinal tuberculosis in pregnancy. Int J Gynaecol Obstet 2008;102:298-300. Martel CG, Volpi-Abadie J, Ural K. Anesthetic management of the parturient for lumbar disc surgery in the prone position. Ochsner J 2015;15:259-61. Iyilikçi L, Erbayraktar S, Tural AN, Celik M, Sannav S. Anesthetic management of lumbar discectomy in a pregnant patient. J Anesth 2004;18:45-7. Chilkoti GT, Mohta M, Duggal S, Saxena AK. Anaesthetic concerns of a pregnant patient with Pott's spine for spine surgery in prone position. Indian J Anaesth 2016;60:518-9. Han IH, Kuh SU, Kim JH, Chin DK, Kim KS, Yoon YS, et al. Clinical approach and surgical strategy for spinal diseases in pregnant women: A report of ten cases. Spine (Phila Pa 1976) 2008;33:E614-9. Kanas M, Kunzle H, Martins DE, Kirsch LA, Puertas EB, Wajchenberg M. Diskectomy during pregnancy: Case report and review of the literature. Global Spine J 2015;5:130-4. Kurahashi N, Komasawa N, Hattori K, Minami T. Rapid-sequence intubation of a patient with difficult airway using a double-lumen endotracheal tube with the Pentax-AWS airwayscope and a soft-tipped tube exchanger. J Clin Anesth 2017;36:14-5.